WASHINGTON -- Already a done deal in Congress, the Iran nuclear agreement gained more momentum Sunday when former Secretary of State Colin Powell and Rep. Debbie Wasserman Schultz, the head of the Democratic National Committee, announced their support. 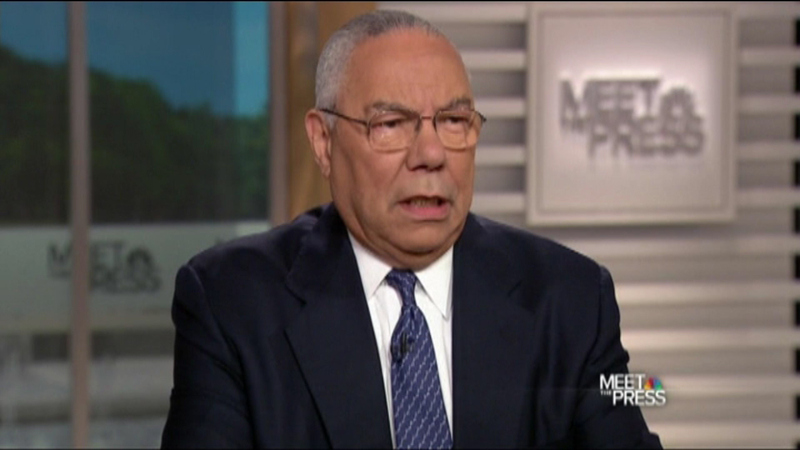 Powell, secretary of state under President George W. Bush, called the agreement "a pretty good deal" that would reduce the threat of Iran gaining a nuclear weapon. Iran's nuclear program "has been thrown into a detour" making it less likely it can produce a nuclear weapon to be used against Israel or other countries, Powell said. "So that's pretty good," he told NBC's "Meet the Press." Wasserman Schultz, D-Fla., said the decision to endorse the agreement was the most difficult one she has made in nearly 23 years in elected office. The Jewish lawmaker wrote in The Miami Herald that while she has concerns about the agreement, the deal "provides the best chance to ensure" security for the U.S., Israel and other allies. "Under the agreement Iran will not be able to produce a nuclear bomb for at least 10-15 years," she said, while the U.S. and its allies "will be able to more closely concentrate on stopping Iran's terrorist activity." Wasserman Schultz choked back tears as she described her decision to back the Iran deal as "a Jewish mother" and American citizen. "There's nothing more important to me, as a Jew, (than) to ensure that Israel's existence is there throughout our generations," she said on CNN's "State of the Union." "And I'm confident that the process I have gone through to reach this decision is one that will ensure that Israel will be there forever." The White House has clinched the necessary Senate votes to ensure that Congress will uphold the deal even if President Barack Obama ends up having to veto a disapproval resolution set for a vote in the week ahead. But with that support in hand and more piling up, the White House and congressional backers of the deal have begun aiming for a more ambitious goal: enough commitments to bottle up the disapproval resolution in the Senate with a filibuster, preventing it from even coming to a final vote. That effort suffered a setback on Friday as Sen. Ben Cardin of Maryland, top Democrat on the Senate Foreign Relations Committee, said he opposed the deal. Thirty-eight senators back the agreement, three votes shy of the 41 needed to filibuster a disapproval resolution and block it from passing. Powell, who served as national security adviser under President Ronald Reagan, invoked Reagan's oft-quoted maxim that the West should "trust but verify" any agreements with the former Soviet Union. "With respect to the Iranians, it's don't trust - never trust - and always verify," Powell said. "And I think a very vigorous verification regime has been put in place," with the International Atomic Energy Agency and other international organizations monitoring Iran's compliance.